North Carolina's attorney general said Tuesday that he would refuse to defend the state's new bathroom law in court, which a growing chorus of critics are calling it an anti-LGBT measure. "We're talking about discrimination here," Attorney General Roy Cooper said at a press conference. "Not only is this new law a national embarrassment, it will set North Carolina's economy back." 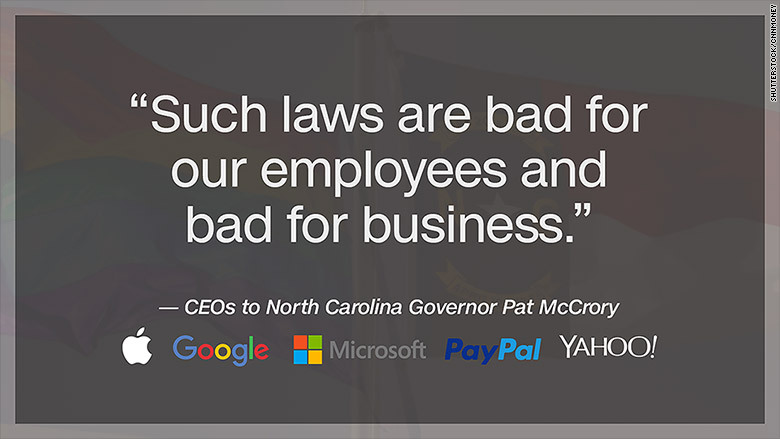 Cooper spoke as more than 80 CEOs and executives co-signed a letter to North Carolina's governor pushing for a repeal of a "deeply discriminatory" bathroom law. 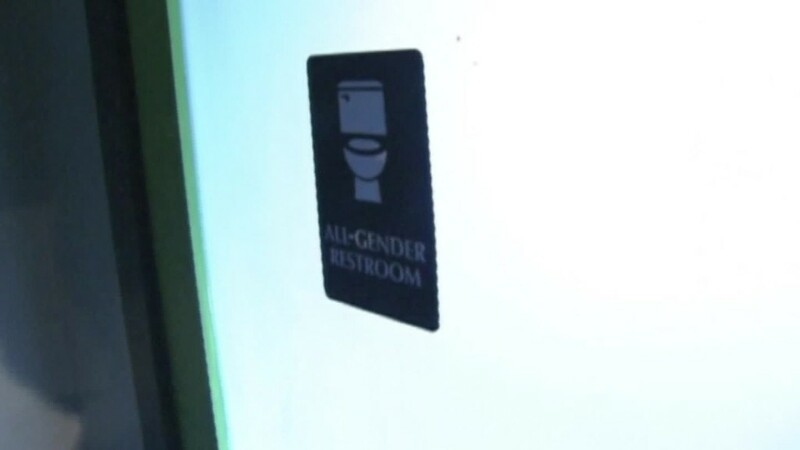 HB 2 was enacted last week, and it requires people to use bathrooms that correspond to the gender on their birth certificate rather than their gender identity. It's drawn a torrent of critics who call the bill "anti-LGBT" -- and a growing group of business leaders are warning that it's bad for the state's economy. "We believe that HB 2 will make it far more challenging for businesses across the state to recruit and retain the nation's best and brightest workers and attract the most talented students from across the nation. It will also diminish the state's draw as a destination for tourism, new businesses, and economic activity," the letter to Governor Pat McCrory reads. It's signed by companies including Apple (AAPL), Google (GOOG), Microsoft (MSFT), Yahoo (YAHOF), PayPal (PYPL), IBM (IBM), Salesforce (CRM), Facebook (FB), LinkedIn (LNKD), Twitter (TWTR), Intel (INTC), Pfizer (PFE) and Marriott (MAR). Two LGBT rights advocacy groups -- the national Human Rights Campaign and Equality North Carolina -- gathered the signatures and plan to deliver the note to McCrory on Thursday. Three North Carolina-based businesses that have openly gay people in leadership roles -- Workplace Options, Replacements, Ltd. and Mithcell Gold + Bob WIlliams -- also signed the letter. It urges lawmakers to repeal the law in the state's upcoming legislative session, which takes effect April 25. HB 2 was prompted by an ordinance enacted in Charlotte that expressly permitted transgendered individuals to use the bathroom of the gender they identify with. The state legislature called a special session in reaction and pushed HB 2 through within a matter of days. The bill passed the state House 82-26 and the state Senate 32-0, with Senate Democrats walking out and not voting in protest. The measure has been condemned by a myriad of advocacy groups, politicians and businesses -- including the American Civil Liberties Union, the NBA, and High Point Furniture Market, which generates $5 billion for the state each year. Governor McCrory has defended the law, saying it's about protecting privacy. "[Charlotte's] ordinance defied common sense, allowing men to use women's bathroom/locker room for instance," he said. North Carolina is the first state is in the nation to enact such a law, HRC says it conflicts with federal law and could cost the state billions in education funding. "North Carolina school districts that comply with the law will now be in direct violation of Title IX, subjecting the school districts to massive liability and putting an estimated $4.5 billion of federal funding from the U.S. Department of Education," HRC and Equality NC said in a joint statement.